-- The best way to clean a wooden cutting board is to use lemon juice because it's a natural bleach. 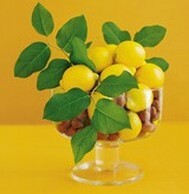 -- Slice a lemon in half; squeeze the juice onto the soiled surface, rub, and let sit for 20 minutes. Rinse with water. -- Harsh detergents and bleach may take out stains, but they do not necessarily whiten better than other alternatives. Try using lemons or lemon juice to keep your laundry room bleach-free. -- Add 1/2 cup strained lemon juice to the wash cycle of a normal-size load. As your whites soak in the warm water, the lemon juice will gently bleach the items in the load without harming the fabric. -- Clean up dirty tile grout in the bathroom or laundry room with a simple lemon juice-based recipe. It may sound weird, but equal parts lemon juice and cream of tartar sauce makes a fantastic lime/mildew/dirt remover. -- The lemon's natural whitening agent combined with the stable cream of tartar base makes a child-friendly, non-toxic bleach to use on high-traffic areas like the bathroom. -- To gently clean copper, salt a lemon wedge and scrub the copper surface. -- The coarse salt will act as an abrasive to strip the copper of dirt and grime, while the lemon will gently lift grease to bring your pots back to their original shine. Below are before and after pictures of a porcelain cup that is used strictly for drinking tea. Now my husband has a cup of tea every night and keeps it warm on a small hot plate for several hours. This causes his cups to become stained severely and with just a small amount of lemon juice on a sponge the results are amazing. Now imagine if you used harsh chemicals it would require washing the cup after wards but with the lemon you just rinse and use. 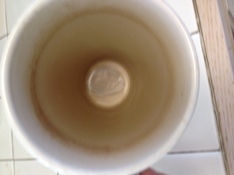 A coffee cup before Lemon Juice Cleaning. 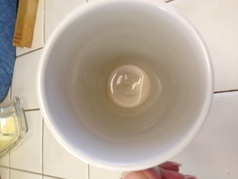 The same coffee cup after a Lemon Juice Cleaning.